ZAANHA 2015 – FASTEN YOUR SEAT BELTS! and more and more impoverished children are being introduced to the joys of learning! Leopard prints have continued to be popular and our Nepalese Tiger scarf (inspired by an early Nepali carpet) was a sell out! I will be travelling to Nepal in early February to work with our artisans there. Digital printing on cashmere has finally arrived in Nepal and we are excited about showcasing some beautiful and unusual prints. We had a tremendous response to our new quilted silk and cotton jackets and have included a visit to the fabled Rajasthani city of Jaipur. I will be working with the eponymous designer Nayika who will produce some stunning jackets and coats for us. 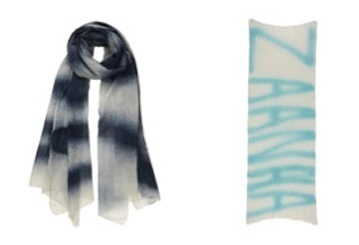 Our signature is hidden in the scarf we introduced this fall. ZAANHA means women in Dari, one of the principal languages spoken in Afghanistan. What better way to celebrate International Women’s Day on March 8th? Look for new colors in the spring. Our trunk show schedule is taking shape. For those in the east and south, in March we will be traveling down the eastern seaboard and end up in southern FL! If you’re interested in hosting a show, please let me know. Our long awaited new website will debut in early April – a new look and functionality. We’re very excited about it and will announce the launch – stay tuned! And last, with the installation of the new screening room at the center for working street children in Kabul, we will now be able to have regular meetings with the children we are helping as well as many of the Afghans who work so hard to help make our programs successful. We will share some of these talks through short videos that will be posted on our website, YouTube and Facebook. See first hand what a difference your purchases and donations are making! We look forward to having you join us for many of the events we have planned for this year.